Home Opinion Guest Posts What are the Benefits of Nicotine Salts? 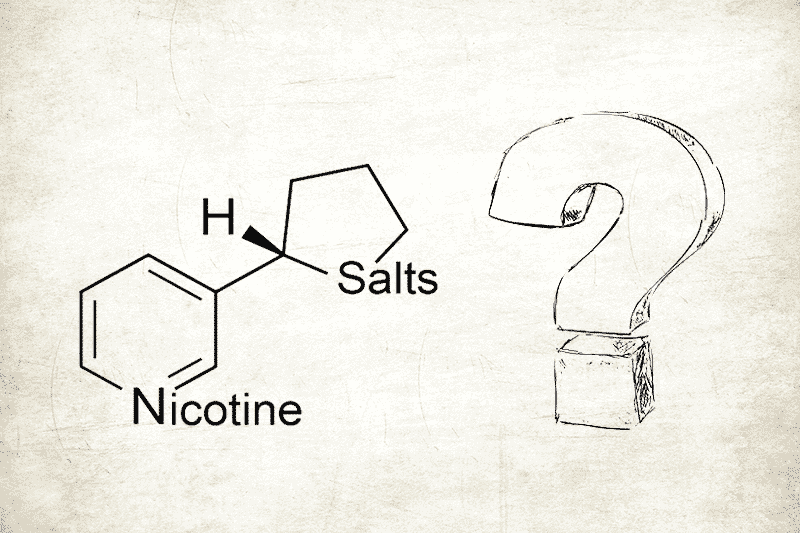 With so many releases of open and closed pod devices as well as major vape brands dropping full nicotine salt lines, it makes you wonder — What are nic salts, and what’s so great about them? Nicotine salts are arguably the next big thing in vape industry! Not that they haven’t been around previously, but there has definitely been a large uptick in the trend. For those of us in the dark about the differences between regular ole e-juice, and nic salts, let’s dig a little deeper, and uncover this raging phenomenon. So what’s the difference between regular E-juice and Nicotine Salts? Besides the lack of massive cloud production you may be at a loss for what the true differential factor is between regular e-juice, and nic salts. Well, if you were a heavy smoker you may have felt that there was a large disparity between the experience of smoking a cigarette compared to hitting a vape. I’m sure we all remember the 24mg e-juice back in the early 2000’s that used to taste like charcoal, and burnt your throat, and lungs without fail. Well, nicotine salts are the solution to both of these problems. The chemical structure as well as the higher nicotine levels allow the user to get a very similar experience to smoking a cigarette all while maintaining the intended flavor and has a smoother throat hit. Freebase nicotine is what is in your average e-juice. It is also what tobacco companies have been using since the 1960’s. Freebase nicotine is the purest form of nicotine compared to other derivatives. Due to the purity levels, it is more potent when heated and is easily absorbed into your bloodstream. Nicotine in tobacco leaves as they are found in nature has the chemical makeup similar to that of salt. This is where we get the salt in “nic salt” which is counter to the belief that somehow salt is added to nicotine to create what we call nic salt. Freebase nicotine is an extra step in a chemical process that really starts with the natural makeup of nicotine in tobacco leaves. But don’t get us wrong here, nicotine salts are treated with benzoic acid which makes it possible to vape at lower temperatures, gives you a smoother throat hit, lowers pH levels and creates a chemical reaction that makes the nicotine salt more absorbable like free base nicotine. It’s a lot, I know. But you can get a more in depth explanation here. What Device is best for Nicotine Salts? Nicotine salts are best used in low wattage devices. So, sorry but if you are using a high powered box mod, you will need to pick up a low wattage device. The major thing to consider when purchasing a low wattage device to enjoy nic salts is whether or not you choose a closed or open system. A closed system is something like Juul, where the device is their branded product, and cannot be refilled, you simply replace the pod. An open system allows you to enjoy whatever juice you want from whatever brand even just regular ole e-juice if you please. The only downfall is that if you do prefer the flavors of the closed pod system, you’ll have to use their product (tricky tricky!). What are the top Nic Salt Brands? Juul is one of the most popular closed systems that has pre-filled pods made with nic salt, and they have an awesome Classic tobacco flavor that really accomplishes the delicious subtle notes of a good tobacco flavor. Phix is also another great closed system to try out as well, with a diverse flavor selection. For open pod systems, like the Suorin Air, or Aspire Breeze, will allow for more flavor options as they can be filled with the any brand, or flavor instead of the limited flavor option of a closed pod system. With recent releases from Ruthless E-juice to VGOD classics your options will seem endless. VGOD has a wonderful Pink Cakes flavor that is a Custard vape dream while Ruthless nails the perfect strawberry, watermelon flavor with Ez Duz It nic salt. The list literally goes on. Previous articleConvection vs. Conduction: Is One Type of Vape Better Than the Other?